So the head to head battle continued this weekend down in Mexico. Merlin Puettman and his 5-1600 vs Greg Piraino and his class 11 sedan. The challenge: 250 miles of race course with 108 miles of new terrain. 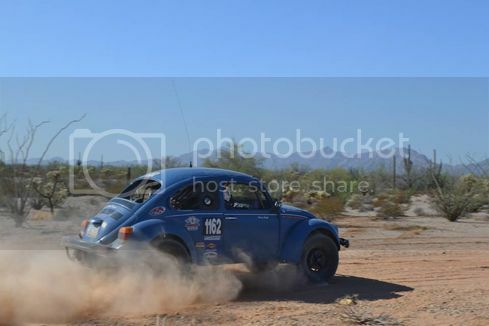 Todd Elam of the Southern Arizona Desert Racing promotions group brought back a classic course: The Point 2 Point! 1998 was the last time racers would run their cars from the mexican border town of Sonoyta to Puerto Penasco. The first 108 miles would prove to be the most difficult. In one corner is Merlin's 5-1600. The other, Greg's class 11 sedan. With the series tied at one race win each, Saturday's race would prove who was best this day. Merlin set a quick pace to start and Greg would fall behind. However, not all races are won in the first 50 miles and this was no exception. At the midway pit Merlin still held a sizable lead, but that would all go by the wayside. At rm185 Merlin would lose a limiting strap and eventually grenade a CV. Unable to get a spare in time, Merlin would timeout. DNF for the 5-1600. Greg would run a slow, but steady pace. He lost first and second gear, but would fight on eventually passing Merlin on the side of the course. BUT, victory would not be his today. Racing over 100 miles with only third and fourth gear, Greg would run out of gas at rm222. His chase crew could not get him fuel in time and the class 11 would timeout, a DNF. 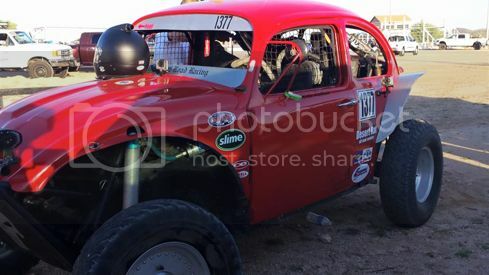 So with that said, 2015 head to head battle comes down to the December Cholla 250. I have spoken to both drivers and they hope to bring their cars to the Hassayampa run for all to see. That would be awesome to have them at the run maybe Give a few rides so we can see how these race cars handle. [ Go to page: 1 ...	3, 4, 5	] 60 wideopenmotorsports 49183 CLASS 5 Resurrection!